A couple of months ago I shared the Boxy Fox pattern on the Fairfield World site and then a couple of weeks ago I added the Boxy Owl. Now I am completing this little boxy buddy trio with the Boxy Bear. When I first made the fox I drew up designs for several different animals using that boxy shape. I decided on the fox first and thought I might make some more later. This month I decided to add a couple more. I decided that I would stick with kind of woodsy animals. 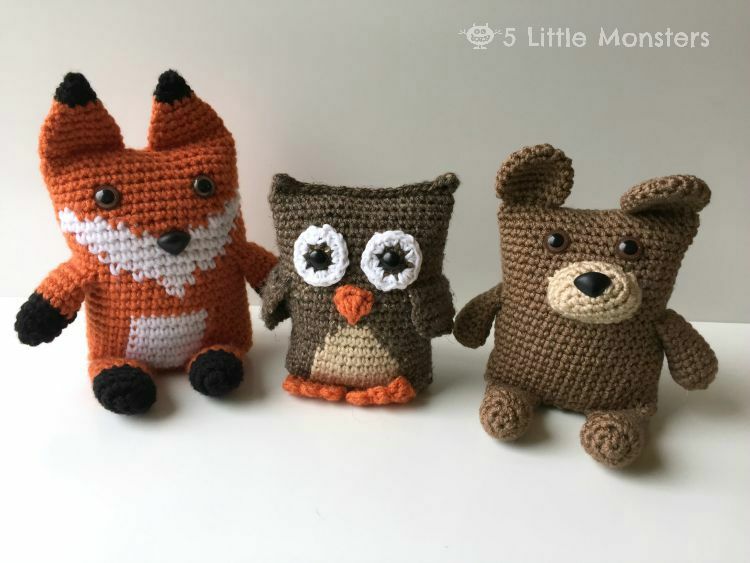 All three of them are made in the same way, with a rectangular base and then crocheted around with the top flattened and sewn or crocheted closed. The differences between the animals are in the color changes and the arms/wings, legs/feet, ears and faces. 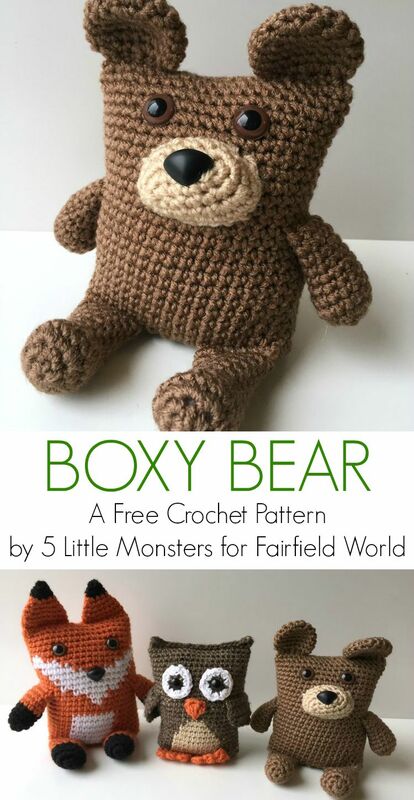 You can get the pattern for Boxy Bear on the Fairfield World Site HERE. The Boxy Fox pattern is available HERE. And Boxy Owl can be found HERE. I love these boxy animals! Any chance you will be doing an elephant? I don't know, I drew up designs for several different animals. I was thinking I would stop with these three since they are all kind of woodland type animals but maybe I should do another set that is some other kind of animals, african animals or jungle animals or something like that. An elephant, monkey, and lion or something like that would be fun. Now you've got me thinking. I know my son would love an elephant because that is his favorite animal. Please oh please do a hedgehog?!? Such lovable cuteness! Love the little cuties! ... .....and then ocean creatures! Oh my gosh, I can barely handle how cute these are. Can't wait to make one for a good friend's little girl!!! LOVE. Hi! I have been working on your boxy bear pattern and came upon an issue when working through the muzzle portion. If I follow the steps as written, it is not coming out like your picture? In fact on round 3 or 4 where I should have 18 stitches, I come out with 23 and then add even more on the next row. Not sure if I'm just reading it wrong or if there might be a misprint on this step because everything else has come out beautifully! Would love any help you can offer - thanksgiving! i'm not understanding the beginning...where we add the feet and start the round....cant understand what we are joing?? Basically none of this pattern worked at all. Nothing came out looking like it should and the pattern explanation makes zero sense. I failed at this miserably. Very frusterating. I'm really sorry it didn't work for you. If you run into any issues you are always welcome to ask me and I will try to help however I can. I'm guessing that the last comment asking for help was from you and I'm sorry I didn't get back to you right away. I usually try to answer questions quickly but last week I took a little break from blogging to be able to spend Christmas time with my family so I wasn't really checking my blog. Sorry again. I feel really bad that you had such a bad experience. 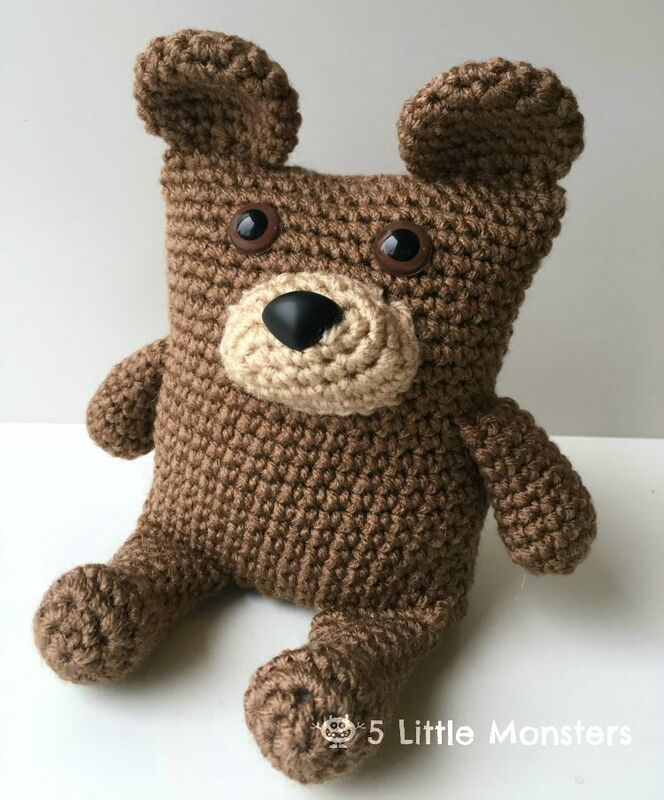 Oh my goodness, I can't tell you how enjoyable it was to make Boxy Bear! Thank you SO MUCH for sharing this with us! Mostly we used to purchase different types of handmade baby toys through which we are able to entertain our baby. But here in this article we have found handmade boxy bears with good attractive design and techniques. Bear and especially teddy bears are the special attraction for toys for our kids and from here we can get different types of suitable collection of baby toys. Love the bear pattern. Have changed a few things about it to suit me, and am making it much bigger, but the idea of crocheting in the appendages as you go is great. I can see it turning into a bear as I stitch :-) Thanks so much, it's really cute. Here's my tip due to back issues I can't go downstairs to my sewing machine to make the pouch for the poly weights. I found a old random baby sock. I filled it up with weights and then whipped stitched it closed. Works like a charm. Can someone help with the boxy bear? i'm new to crochet. I just attached the legs, did the 5sc up the side, and 16 sc across the row. next it says to join and have 42. i can't figure that out. Can anyone help?